Elected to Division Three (North) 1950. Relegated to The Conference 2003. Promoted to Coca Cola League Two 2004. The attractive county seat of rural Shropshire is a far cry from the grim industrial towns of the Midlands and Lancashire that spawned the growth of association football in late 19th century England but nevertheless, Shrewsbury is one of the cradles of the modern game. Boys attending the famous public school played a form of football in the 1860s and the modern club, founded in 1886, took its original blue and white colours from the school. The club played at various venues and competed in the Shropshire & District Birmingham League and later the Midland League. The first evidence of a club crest being worn comes from 1907, which is remarkably early, and consisted of the shrewsbury coat of arms. This consisted of three leopard's head (known in heraldry as "loggerheads") above the Latin phrase, Floreat Salopia ("May Shrewsbury Flourish"). In 1910 Shrewsbury moved into Gay Meadow, so called because of its previous use as a site for fair grounds. 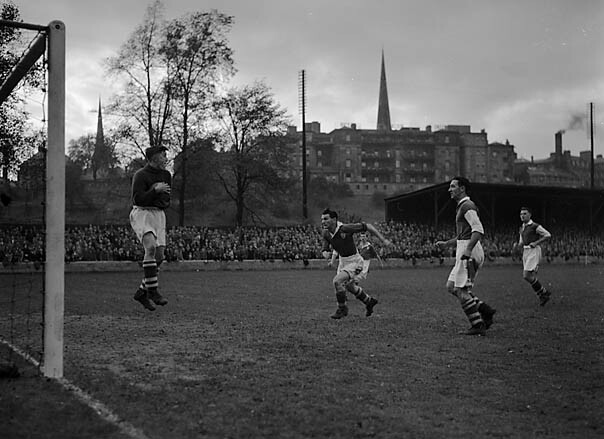 Adjacent to the River Severn, Gay Meadow was one of the most picturesque grounds in the League. 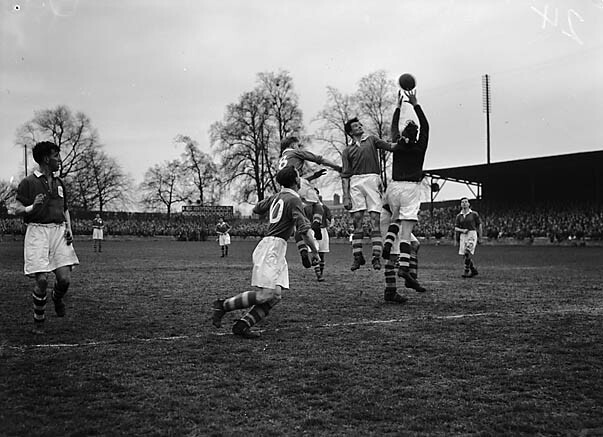 Situated on the Welsh border, Shrewsbury regularly competed in the Welsh Cup, winning the competition for the first time in 1891 and their reserve side had several spells in the Welsh League. The crest reappeared in 1949 and was used off and on until 1953. Although it is hard to verify the details, it appears that this version may have combined the arms of Shrewsbury with those of Atcham Rural District Council, adding the Atcham bridge above the loggerheads. 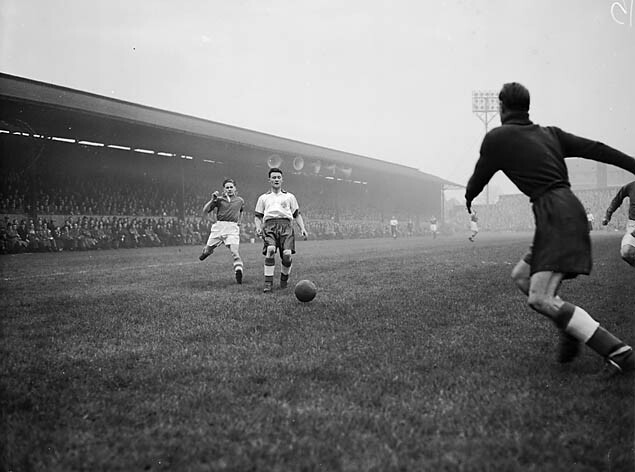 In 1950 the Football League decided to expand the two regional Third Divisions with the addition of two clubs in each section. “The Shrews” were successful on the first of three ballots and took up a place in the northern section. At the end of the season they were transferred to Division Three (South) where they remained until 1958 when they were placed in Division Four after the regional divisions were scrapped. In 1960 the club introduced their own crest, a rather uninspiring affair that would not have won any design awards. This was replaced a decade later by a more traditional design that incorporated the arms of the town within an enclosing shield with the name of the club embroidered in full. Promoted at the end of their first season in the lowest division, Shrewsbury remained in the Third Division until 1979 apart from one season in the Fourth (1974-75). It was during this brief spell in the basement that Shrewsbury adopted amber and blue colours. Although it was widely believed that this was an innovation at the time, HFK has uncovered evidence that amber featured in the team's strip as far back as 1935. In 1979 the club won the Third Division championship and promotion to Division Two for the first time in their history. A new crest was introduced to celebrate this achievement: the loggerheads remained but the design and shape of the surrounding embroidery were most unusual. The design was simplified in 1983 by which point the loggerheads more closely resembled lions. In 1986 the board decided on a change of branding and introduced a radically new badge inspired by the club's nickname. This initially appeared on the team's amber and blue shirts but in 1987 a complete change of image was thought desirable and for the next four seasons, the team played in white shirts with the Shrew motif. For ten years, the Shrews held their own but relegation in 1989 and again in 1992 saw them back in the Fourth Division (renamed Barclays Division Three with the advent of the Premier League). In an apparent attempt to halt this decline, the club dropped the white shirts in favour of yellow and blue stripes. The more traditional amber and blue was restored in 1992, albeit in one of the ugliest tops that the 90s inflicted on long-suffering supporters, along with the previous loggerheads crest, now placed on a shield. In 1993 the crest was again revised, returning more or less full circle to the original worn in 1907 but with the addition of STFC. In 1994 Shrewsbury were Third Division champions and were to the third tier but in 1997 they were relegated back to Nationwide Division Three. After nine years of mid-table performances, Shrewsbury finished at the bottom of the League in 2003 some seven points adrift and went down to the Conference. They finished third the following season, 17 points behind second placed Hereford United to qualify for the play-offs. The Shrews reached the final after a penalty competition to decide their tie with Barnet. After extra time in the final against Aldershot Town the scores were 0-0 but the Shrewsbury players held their nerve to win another penalty shoot-out 3-0 and secure a return to the Football League. For many years opinion in Shrewsbury was divided over whether the animals featured in the town's coat of arms were leopards or lions. In November 2008 the Shropshire Star reported that an expert called in to resolve the issue had found that the weight of tradition was in favour of them being leopards. This came a little too late for the football club who, earlier in the year, had commissioned a new crest with a lion as its centrepiece. For their 125th anniversary in 2010-11, the club adopted a very simple kit in mid-blue and white along with a special crest, which appeared only on the home strip. A campaign to ditch the lion crest and restore the loggerheads received overwhelming support in a poll held in 2014 and as a result the club announced that a new crest would be introduced for the 2015-16 season, which would be in League One after the team clinched an automatic promotion place. If this were not sufficient cause for fans to celebrate, the always popular amber and blue striped shirts were reintroduced. Photograph courtesy of Greger Lindberg. Crests are the property of Shrewsbury Town FC.